You want to visit some beautiful and unique places without burning too many calories. Pooch proclivity: No doggies allowed at the marsh. If you want to take your dog to a boardwalk, you might have to go to New Jersey instead. Parking predicament: With only eight legal parking spots at this popular site and frequent enforcement applied to those who make up their own spots, Constitution Marsh has made the very reasonable request for folks to PLEASE not illegally swim at Indian Brook Falls while taking up a parking spot at Constitution Marsh. The falls are unaffiliated with Constitution Marsh, and the visitor’s center lets visitors park here to visit the falls out of the goodness of their hearts – a goodness that you will be testing if you leave your car parked here all day while enjoying an illegal frolic. Please help to keep things as harmonious as possible out here, and be courteous to your fellow nature lovers – visit the falls, take some pictures (pictures which hopefully won’t be ruined by other people treating this place like Splashdown Beach) and head on down to check out the one-of-a-kind boardwalk at Constitution Marsh. Thanks for being awesome! Background you can feel free to skip: I wonder if the residents of Cold Spring know how good they have it. There are no fewer than four really nice hikes within a couple miles of the town center, and that’s if you count Constitution Marsh and Indian Brook Falls as one (the others are Breakneck Ridge, Bull Hill and Little Stony Point, and there are more around). This hike is great if you just want to get out into nature, but don’t have a whole lot of time or energy to burn. It also makes a nice appetizer for a bigger hike in the area, like Breakneck Ridge or Bull Hill. According to the sign as you enter Constitution Marsh, this is an Important Bird Area. As you wander out onto the boardwalk, taking in the views of Storm King and Breakneck Ridge dipping down to meet the river as endless acres of rushes sway in the breeze in-between, please take a moment to say hello to the Important Ducks. “Good afternoon, Important Duck,” is the kind of greeting they’re accustomed to. Let’s not commit any social blunders out there, folks. Otherwise, just enjoy the beautiful waterfall and the pleasant stroll over some small hills and rocks out to the marsh boardwalk, which really is a one-of-a kind place. There are plenty of worse ways to spend an afternoon. I’m not immediately thinking of too many that are better. 1. Let’s visit the waterfall first, since it’s a nice warm-up that gives an immediate payoff. As you drive into the parking area, you’ll see a large sign that invites you to turn left to “Drive to Waterfall Trail.” The parking area for the falls is only a few hundred yards up there (the parking area is just on the far side of the Route 9D bridge, which is high above to your left as you drive in), so it’s your call if you’d rather just walk up there or drive it. With or without your car, turn left up the dirt road here and head towards the falls. **UPDATE 11/8/2014** The very nice sign pictured below is apparently no longer present in the parking area, and the spot I referred to above as the “parking area for the falls” apparently now has NO PARKING signs posted (thank for the updated information in your comment, Jason!). So from the parking area for the marsh, it looks like the only legal way to visit the falls is to stroll up there (it’s really not far – about .2 miles, or five minutes walking). Just walk up Indian Brook Road towards Rt 9D (away from the Hudson River), walk under the giant bridge for 9D, and you’ll arrive at the old gate for the waterfall trail in just a few more moments. 3. Walk around the gate and across the little bridge just beyond. Behind you, the Route 9D bridge looks way bigger than it does when you’re driving across it. 4. Follow the trail through a left turn after the little bridge, heading upstream just beside the creek. 5. Boom! There it is. Indian Brook Falls. It’s funny – the Internet contains very little information about these falls, but this is such a nice spot. And it’s a short enough hike that you can lug out a tripod and slow that shutter down just a bit. That’s about the only trick I know how to do with a camera, but still, it’s not a bad trick. If you didn’t already know how to do that, it’s a nice way to make your waterfall pictures look more postcardy. 6. When you’re finished checking out the falls, head back to the graffiti trailhead. 7. Either via car or foot, head back down to the Constitution Marsh parking area, where that big wooden sign is. If your car isn’t already there, leave it there now. 8. Head down the driveway, towards the Hudson River. You’ll see plenty of signs letting you know that you’re going the right way. 9. Towards the bottom of the hill, you’ll see the Audubon Society building, with a blue-diamond trail marker in front. Take a right to follow those blue diamonds across the yard, past the educational signage and across the little footbridge. 10. Keep following the blue diamonds through the woods. Keep your eye on them, too. This is a short trail, but you can lose it if you aren’t careful. 11. If you’d like to play Forrest Gump of the Marshlands, enjoy a seat on this very cool homemade bench with a view of the Hudson River and West Point on the other side. 12. The trail wraps around this little spit of land and drops you off onto the main event: The Constitution Marsh boardwalk. 13. Stroll around. Take pictures. Read educational signs. Befriend Important Birds. 14. When you’re done, retrace your steps back to your car. I tried opening the door to the Audubon Society building (the sign said “Open”) on our way out, but the door was locked. Not sure what’s in there, but the people who run this place sure do a nice job of maintaining it. Thank them if you get a chance. And if you’re not on your way to another hike in the area, a stroll around the shops on Market Street in Cold Spring might be a perfect way to end the day (we stuffed our faces at Cold Spring Pizza and didn’t regret it for a second). You can also get directions by checking out the Constitution Marsh/Indian Brook Falls entry on the HiketheHudsonValley.com Google map. Sorta nearby address for your GPS: The Constitution Marsh Sanctuary has its own address. Far out! Related resources: If you’re looking for actual facts and/or useful information, visit the Constitution Marsh homepage. Is there any update on the parking situation here? All these comments seem to be a few years old, so was just wondering if there parking is better yet? Hi Jackie — As far as I know, the parking situation here is unchanged. If I were planning a visit here, I’d make it a point to come at an off-peak time (on a weekday or very, very early on a weekend). If anyone has more current news now or in the future, please drop a comment accordingly and I’ll update the trail guide above. Thanks! Hi Jackie, Unfortunately the parking situation will not be changing in the foreseeable future. We cannot allow visitors to drive down and park near the nature center as the road is only one lane and some very tricky situations can arise if someone is coming down while someone else is trying to leave. As we have said before, we understand that the limited number of spaces is frustrating but it helps maximize the experience for all visitors by keeping noise pollution and congestion on the trails and boardwalk to a minimum. We recommend coming early in the morning or in the evening on weekends to avoid the crowds (and see some more wildlife too!) or even better, on a weekday. If the forecast is poor and you have a good rain coat, you just might have the boardwalk to yourself! Thanks so much for the thoughtful reply and helpful information, Constitution Marsh Audubon Center and Sanctuary! Hi Lisa — I’m afraid not. The trail to the boardwalk is quite hilly and rough. I saw the site today but there was no where to park. When you say the falls is beyond the gate, do you mean walk behind the gate, or take the dirt road to the left of the gate? You walk around the gate and continue on the path behind it. Thank you for your visit and beautifully written review, Mike! We would like to clear up a bit of confusion. Swimming at the falls is illegal. Park rangers and police officers regularly check the area and we hate to see someone’s day ruined by being issued a fine. Our parking lot is very limited (8 spots) and in the past we have allowed waterfall visitors to share the lot because of our close proximity and it being the only legal place to park in the area. However, with such a high increase of visitors during the summer, we want everyone to be able to enjoy the beautiful scenery and wildlife Constitution Marsh has to offer. We humbly request that waterfall visitors please limit their time spent at the falls so that marsh visitors have a place to park without risk of being ticketed or towed. If you plan to spend an extended amount of time, we highly suggest parking in Cold Spring and take a taxi to keep a high turn over rate of vehicles coming and going. We appreciate your cooperation and look forward to your visit! What a great site! You are offering so much information, and I don’t mind the humor one bit. Curious, is there a way to walk to this hike from the train stop in ColdSpring? I’ve seen what looks like some sort of path just south of the platform on the northbound side, but I don’t know where it leads. Unfortunately, there is no hiking trail from the train station to the marsh. All of the property in between is private land. There are taxi’s you can call in Cold Spring to take you to the marsh. We are so glad so many people are interested in coming to visit us here at the Marsh! Since we’re once again entering peak hiking season, our parking lot is getting quite busy. Again, we ask that you only park in the 8 spaces provided and not on the side of the road (where you will likely get a ticket and/or towed). We understand that the limited parking can be frustrating and we want everyone to know that while we are considering expanding our parking lot slightly (a complex legal process), the limited number of spaces helps maximize the nature experience for all visitors by keeping noise pollution and congestion on the trails and boardwalk to a minimum. Thanks for the great information. I just googled places to hike, or water falls around west point, and this came up. Gotta Love Google. 🙂 We are headed to West Point Military Academy tomorrow morning, to visit our son who is in school there. We haven’t seen him since July, when we dropped him off. I’m very excitted…anyway’s, we are looking for something to do for a couple of hours with him. This looks like a great spot. We are from Michigan, and we are loving the New York, Pensylvania area. In July, we stopped in Dingman’s Ferry, PA. and had a blast visiting all the beautiful falls in the area…definatly worth the trip. Thanks for the overview. I was there yesterday, but didn’t reach the boardwalk, as it started raining. I’d like to add my voice to those asking for more parking. There’s plenty of space for more cars without interfering with the little bit of local traffic or the peace and quiet of the area, both along the road and on the Audubon property. It seems they don’t actually want people to come and visit. Do you/Does anyone know where else to park if the parking lot is full? I’m going to be taking a day trip up there from the city so if we can’t get a parking space our day will be shot. I don’t think there is any extra places to park. Everywhere else around that area has “No Parking” signs posted. I would check out their website (http://constitutionmarsh.audubon.org/) and see if they have any helpful information about extra parking there. Or call their office number and speak to someone personally. But if you do come up here and there is no parking, check out the other hikes that are listed on this hike that are nearby. There is plenty to see and do here in the area so your trip up won’t be for nothing. I’m sure this is a great place but I will never know, there was a county sheriff there and he was giving out tickets and threatened me with a tow truck if I didn’t stop standing ( in my car ) I was waiting for a legal spot which there aren’t enough of. Also the Audubon center was a real surprise, and the touch table was a huge hit with the kids in our group. Thanks for the kind words and the info on the Audubon Center, too, Simon! I’ll have to check it out with my kiddos next time. Much appreciated. I went on this hike earlier today, with 11 other people, including a 2, 3, and 5 year old. Definitely tired them out. The difficulty was perfect for them, and the boardwalk at the end was a great reward. Thank you for another excellent trail guide! 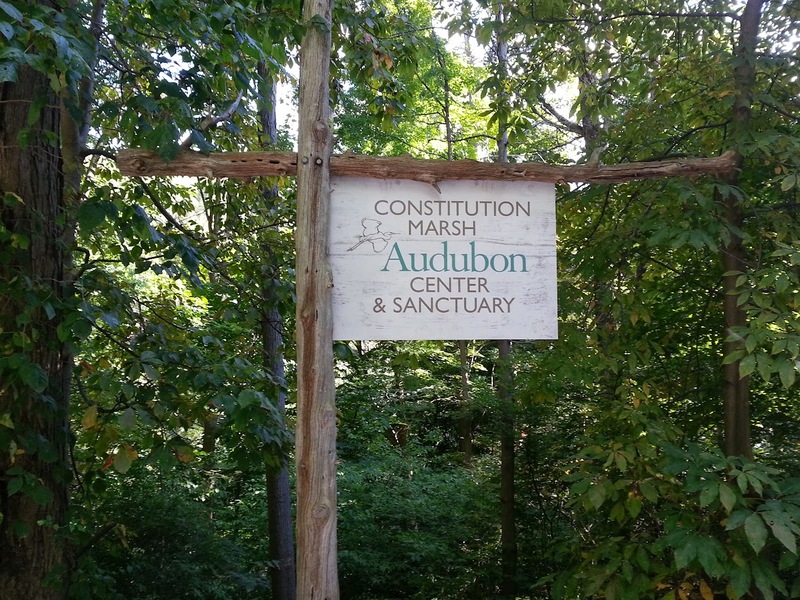 We are so happy that people are finding and experiencing Constitution Marsh Audubon Center & Sanctuary. It is a beautiful place that we love to share with others. As the warmer weather approaches, the Marsh (and waterfall) is becoming quite a busy place for tourists. We ask that you please abide by the parking rules by only parking in the limited spaces provided in the lot (8 cars maximum at a time). Please do not park on the side of the road, as all cars that are parked outside of the parking area are subject to fines and towing. We hope you all enjoy your visit and be sure to come see us at the Nature Center! Thanks so much for leaving this comment and helping people to avoid fines or getting towed! I updated the “Directions to the trailhead” section with a link down to your comment. Hope that helps get the word out there! No way to add to the number of available spots? They were filled by 11 am and there must have been 8 more cars parked illegally. The falls and marsh together were my favorite local spots, but after having the car towed and receiving a summons during Saturday’s visit there is 0 chance of us or our friends ever returning. We checked out this hike yesterday and really enjoyed it. Since it was fairly short, we also went to Scenic Hudson’s West Point Foundry Preserve, also in Cold Spring, to make a really nice morning of discovering the area. I’d highly recommend WPFP; lots of history there! Thanks, as always, for your detailed guides. I just did this hike a few days ago. I wanted to point one thing out and I think this is probably how Michelle (one of the other previous comments) may have missed the falls. That really nice sign you showed that points one way to the falls and the other way to the marsh isn’t there. The sign that is there is this one here (https://lh5.googleusercontent.com/-yDYrkrJNxnE/VBnn8y63NTI/AAAAAAAAGdA/vabTFyQ_FIg/w1185-h889-no/20140917_155802.jpg). And it doesn’t mention anything about the falls. I actually had to ask someone who happened to be walking nearby where the falls were. Also, I don’t think you are allowed to drive to the falls anymore because when I did there were no parking signs everywhere. Well there wasn’t one on the gate itself so I just parked in front of it anyways. But technically I don’t think I was supposed to. But even still, for anyone else who may do this hike, it really isn’t a far walk at all from where the parking area is to where that gate is. Once you park, just turn left and walk up the road until you hit that gate and it’s a very easy and short walk to the falls. Everything else about your guide was spot on and very easy to follow. I really enjoyed it. One other question though. At the falls it seems like the base of the falls is deep enough that you could wade in the water and cool off on a hot day. Do you know if it’s safe to do so? I only ask because I was recently in Hawaii and every tour book I read said not to do so due to some kind of parasite that lived in the water there. Wasn’t sure if we had something similar here. Thanks. Jason, thank you so much for this information! I updated the trail guide above, so hopefully that will help avoid any more confusion. Very much appreciated. As far as swimming/wading in any waterfalls around here, I always just assume that you’re not allowed to, and it seems like that’s pretty much always right. Don’t think there are any parasites in the water (you know, besides the normal stuff) that would make it unsafe, but my (completely uninformed) guess is that swimmers are encouraged to do their swimming elsewhere. Hello! We’ve been enjoying your website and checking out the hikes… We have a 3.5 year old and a 15 month old. Is this trail stroller friendly or should I put him in the pack? Glad it’s been useful to you, Krystle! You could maaaybe pull off a stroller on the way to the falls, but you’ll most definitely need the pack to get to the boardwalk. I’d leave the stroller at home and just use the pack. Hope your family has a great day out there! This was pretty helpful, except we totally missed the waterfall on our way to the marsh (thank you, narrow, windy, one lane road). It was actually easier to see it on the way back. It was a great way to spend the afternoon. Glad you had a great day, Michelle! If there’s anything I can do to make the trail guide clearer to help other people avoid missing the falls as well, please let me know!